It's often the little things that carry the most meaning ... especially on a lazy late winter Sunday. Headquartered in Morristown, NJ, The Seeing Eye organization and Saint David's have a long history. Initiated in 2005 by beloved parent Connie Hays and continued in her memory, the school's Pennies for Puppies program helps to fund a Seeing Eye dog each year. This year's 4th grade boys made the organization's magazine The Guide, page 6. This is another great example of the boys doing good in their extended community. Congratulations, 4th grade! 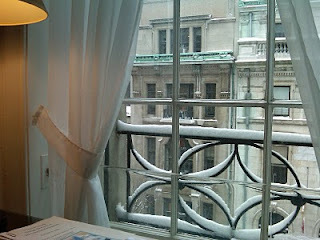 As I watch the snow continue to fall from the window of my office on 89th Street, I come across Parenting for Moral Growth, a publication by the Council for Spiritual and Ethical Education--a thoughtful group. Their Winter issue has a particularly interesting piece on "The 3 Ps -- Perspective Taking, Play and Posing Questions." It's a good quick read for parents of young children (2-7). 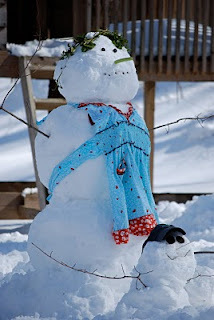 On this the second snow day in as many weeks, many parents may be thinking of some slightly different P's, like, maybe Patience, Perseverance, and Please God let it end! 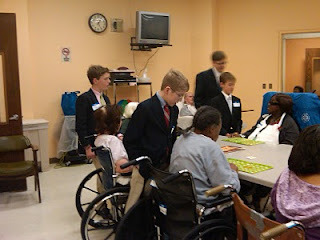 The boys (6th grade) and I spent the late afternoon today with residents of Cardinal Cooke's 7th floor. We played Trivia Bingo. The residents just love their time with the boys. This is our 7th visit this year. All the boys volunteer their time, arriving back at school at 6 PM. It' Saint David's doing good in our community. On an otherwise dark and dreary morning, 8th graders from Nancy Iannicelli’s Humanities class brightened the day with the presentation of their Via Fiorentina projects to a panel of judges in the Hume Library. The boys’ two week Italian Study Tour is fast approaching. I was honored to serve as a judge. Working in groups of five, the boys were asked to focus their research on a building of architectural distinction in Florence, map a route from our hotel to the building, identify a stop along the way worth visiting, produce a “detail” drawing or painting from the exterior or interior, and create an original reproduction of the facade using an art medium of choice. Boys took on the roles of scrittore, artista facciata, artista detaglio and cartografo. From the familiar, Il Duomo and Campanile to Santa Croce and Palazzo Rucellai the boys impressed. One of my favorite buildings in Florence is the fifteenth-century Palazzo Rucellai in the Piazza de’ Rucellai. Designed by Alberti in the mid 1400s, its facade was one of the first to announce the new ideas of Renaissance architecture. The three stories of the facade articulate the classical orders, but with the Tuscan order at the base, Alberti's original in place of the Ionic order in the middle, and a simplified Corinthian order at the top level. Connor S's painting, the third slide below, is a wonderful representation of the facade. Combined with the Loggia de' Rucellai across the road to the left of the palace, and the open space between them, this Rucellai family home forms a spectacular example of Italian Renaissance architecture. I was impressed by the boys' presentation skills and the depth of their research. I was also happy that one group, at least, chose to study Palazzo Rucellai. A slide show of the art produced by the various groups is imbedded. I spent a chunk of my morning today with Kindergarten Theta. As a part of their Social Studies studies they interview members of the Saint David's professional community to gain a sense of exactly what it is they do on a daily basis. It's only through the questions of a five year old that one struggles to explain just what it is one actually does. My favorite question: What number headmaster are you? My answer, number five, led to a series of follow-ups from the boys that would have made any self-respecting New York Times investigative journalist proud. I think my answers were well-received and accepted as, at a minimum, plausible. Thank you K-Theta. Julie Sykes is one of those famous sources of inspiration. In her we see the best of ourselves. She reminds us of our familiar patterns–the things important–honesty, compassion, kindness, humor; Julie’s is a sharp-witted sense of humor, one tempered only by her innate respect for the appropriate. Her uncanny ability to be comfortable with everybody, to put all whom she meets at ease, whether 4, 40 or 140, alum, parent, past parent or prospective parent, colleague, nursery school director or Saint David’s headmaster (and she’s known them all) is unparalleled. What a beautiful night! Welcome. Well now, Carnevale – Carnevale! Where things are not necessarily what they appear to be. There’s a lot of that going around, no – things not being what they seem – the masks, the costumes, the economy. Let’s take the festival itself. Most people, that I know anyway, celebrate Carnevale on the day before Ash Wednesday, but not here at Saint David’s. We’ve moved it from Fat Tuesday to a Lenten Friday; but that’s OK! Fr. Leonard can give us special dispensation, straight from Rome, I’m sure--yes, no, yes. Things are not what they seem. This summer, during his professional-development-sponsored travels Down Under, long- time Saint David's master teacher Tom McLellan visited the Shrine of Remembrance in Melbourne, Victoria, Australia. Mr. McLellan's emotional recollections of his visit to the Shrine resurrected memories from my childhood. Our school-wide theme this year is "the good," a term culled from the last sentence of our mission statement. How do we come to see the good? and how do we as teachers and parents help our children internalize the good? The answer lies not in perceiving true good directly, but through the experiences life affords, the connections that we build. In reference to the Mountains Beyond Mountains post from yesterday, as a father of a child with multiple challenges, I have experienced first hand the incredible frustrations and the debilitating definitions placed on any of us who struggle with some aspect of our learning, development or functioning, often by those around and even closest to us. Aimee Mullins presents an incredible story of how she turned her mountains into opportunities. Aimee suggests that we are "changed" and "marked" by a challenge. She sees adversity not as an obstacle to get around; but part of our life. The question isn't whether we will face adversity in our lives, but how. Our job as parents and teachers isn't to shield our children from adversity, it is rather to prepare them to deal with it well. Instead of trying to "overcome" adversity, Aimee suggests our goal should be to see adversity as natural, consistent, and useful. Conflict is the genesis of creation. It is not the strongest or the most intelligent of a species that survive; it's the most adaptable. I enjoyed her reference to Darwin. Our society often struggles with "disability" and "difference." I was reminded of how careful we as teachers especially must be not to limit or cap a child's potential. Our job is to unlock, inspire and lead out. Aimee's story is a powerful one. One of the many aspects of Saint David's that I truly treasure are the times we come together to celebrate the essence of our mission and our sense of community. Mass is one of these times. Today, Saint David's celebrated Ash Wednesday and the beginning of Lent with a mass at Saint Thomas More. In his homily, our chaplain Steve Katsouros spoke of Tracy Kidder's book Mountains Beyond Mountains which chronicles the work of physician and anthropologist Dr. Paul Farmer, a man who would cure the world. Working in Haiti with the poorest of the poor, Paul Farmer cares for the sick. "Rend your hearts, not your garments." Found in Joel 2:13, this phrase from the Old Testament reminds us of the need to wean ourselves from the material and look within, reflecting upon our actions and thoughts above our possessions. We all have our mountains to climb, and beyond those more mountains. The challenge lies not in being consumed by our own problems, but recognizing and reaching out to others who need our help. Our Chamber Singers, especially soloists James L., James P., Thomas R., Robert A., Henry S., William H., and Michael McC; the 5th and 6th Grade Recorders, and the 5th Grade Bell Choir; my readers: Lawson K., Rafe H., Nicholas C., (pinch hitting for an absent Will K.) and Theo H. all did a superb job after a long 5 day weekend. It was Saint David's at her best! Julie Sykes and Gabrielle Crumlish have been a part of the fabric of Saint David’s School for the past 30 and 41 years respectively. Their significant and defining contributions to the life and vitality of the school are surpassed only by their love for it. Julie and Gabrielle will be retiring this June. Julie’s sons Matthew, ’89, Andrew, ’91, and David, ’95 are all Saint David’s graduates, as are Gabrielle’s sons, Christian in’78, Arthur Jr.,’80, and Peter, ’82. Gabrielle and Julie first came to Saint David’s as parents, Julie in 1980 and Gabrielle in 1969. As the years passed and their sons grew, so did the depth of their involvement and commitment to the school. In 1985 Gabrielle began her professional association with Saint David’s as an assistant kindergarten teacher. As fate would have it, both would serve Saint David’s as her gatekeeper: Gabrielle from 1989 for three years, before courting Julie Sykes and Janet Sughrue to succeed her as co-directors, allowing her to return to her beloved classroom. Julie began her work with the school in 1992 as Co-Director of Admissions. After Janet’s retirement in 2007, Julie served as Director of Admissions through the present. Julie and Gabrielle have helped shape this very special school; their influence will continue to resonate well beyond their departures. The beginning of the school's 59th year saw the faculty embark on the fifth phase of our school-wide Curriculum Initiative. Two questions have guided our work this year: How do we know our boys understand what they are learning? and, How do we know our teaching is effective? To help us critically examine these questions the school invited Harvard University's Mary McFarland to join us in our work this year. Friday's professional development day was the third in a series of days spent with Dr. McFarland this school year. I enjoyed 7th grade's performance of Sophocles' play "Ajax" this morning. Set in the Greek camp on the plains of Asia Minor, after the death of Achilles and before the fall of Troy, the mighty Ajax, played superbly by James B., now the greatest of Greek warriors, is possessed by vengeful anger fueled by pride. He wants to kill all the Greek Kings, especially Agamemnon, played by Luke P., his brother Menelaus, played by Colin J., and of course Odysseus, played by Patrick R., now his sworn enemy, and all their closest supporters. Ego and pride destroy an otherwise valiant warrior. James, in his performance, captured the tragedy of Ajax's fall beautifully and confidently. In Chapel today, I told the story of Clare Boothe Luce, US Congresswoman, who in the early sixties explained to President Kennedy that, "Great men are a sentence." Lincoln's, she said was, "He preserved the Union and freed the slaves," while FDR's was, "He lifted us out of the Great Depression and helped us win a world war." Reflecting on Sophocles Ajax, his sentence might be, "He was a valiant warrior tragically consumed by pride." We do not have to be a president or a "hero" to have a sentence. What's your sentence? As we prepare for the Lenten season at Saint David's, we might well ask ourselves what sentence we would use to describe ourselves today; or what we would like it to be tomorrow. Tonight, I joined twenty-nine Saint David's colleagues in a three hour course in CPR, AED and Basic First Aid. Trainers from Rapid Response Training LLC led the course. It was a hands-on learning experience for all of us. Joining members of the coaching staff, administrative staff and faculty in learning, for some of us refreshing, these basic life saving skills was eye-opening and enjoyable. The unique, balanced mix of humor and seriousness set the perfect tone for the evening. As a parent, I feel an incredible sense of comfort in knowing of the dedication and commitment of so many at Saint David's. Master Teaching: An Act of Persuasion? Cognitive scientist Daniel Willingham, in his book Why Students Don't Learn, suggests that if teachers are to convince students that learning is worth the effort, it requires a significant degree of persuasion. In addition to citing Willingham, Marge Scherer, in a piece entitled Perspectives in the February issue of ASCD's Educational Leadership, describes a few of the "basics" required of expert or master teachers, namely that they demonstrate a cognitive understanding of how children learn; have emotional preparation to relate to many students whose varied needs are not always evident; possess content knowledge from which to draw different ways to present a concept; and, finally have the ability to make teaching decisions quickly and execute them. Teaching and learning both require practice, and practice is work--for the teacher and the learner. Work isn't easy; it's hard. While I do not disagree with Willingham that master teaching may be an act of persuasion, or Scherer and the "basics required," I feel that the master teacher's most important attributes, especially when teaching boys, are actually patience and humor. Boys don't learn subjects, they learn teachers. The greater the degree of patience and the more humor present, the stronger the relationship between the boy and his teacher. Master teachers know how to cultivate meaningful relationships with their learners. They know that the keys to these relationships are patience and humor. It's really not about persuasion. With the launch of their Hope for Haiti Campaign, the Student Council raised $2,138 this morning. Today's "dress down day" is the first in a series of events and activities organized by the boys to assist Haiti (see Chapel post 2/5/10). More to follow. Fifty-nine years ago today, Saint David's School opened her doors for the first time. Twelve 5 year old boys walked through those doors to greet Saint David's only teacher. The founders of our school were bold. Defined as brave, fearless and strong, these bold founders ensured their vision became a reality. Against many odds, they persevered and created something from nothing. We are all the beneficiaries of their vision and labor. Instead of focusing on the school's history this morning, I've chosen instead to focus on embracing the founders' vision with a call to action. Socrates once famously said "... the unexamined life is not worth living." Mr. Imbelli and I boarded a US Air flight to Boston's Logan Airport early Wednesday morning to visit Alums at St. Mark's and Milton Academy. After the short, but snow delayed flight we sat with alums Jack '06, Harry '06, Jack '06, Pierre '07, and Peter '08 for a round table and lunch in the beautiful St. Mark's cafeteria. The boys were remarkably happy and comfortable. We then drove to Milton Academy to visit Curtis '08 before he left for a ski meet. We learned a lot from the boys about their successful transitions to high school, as well as suggestions for improvements at Saint David's. It was a productive and enjoyable visit. The boys are proud of their Alma Mater. As two of our faculty battled strong headwinds and blood sucking insects this summer, riding their push-bikes one thousand miles from New York City to Key West, Florida, two of the O’Halloran children meandered through the bike paths of New York and the quiet back streets of Rehoboth Beach, Delaware. For both groups, it was a memorable and enjoyable first; but not one that came without a price. It took practice, a sense of daring, skill and hard work, not to mention the loss of a little blood, sweat and even a few tears. To move their bikes, Messrs Carr and Goulding along with Max and Sasha, had to “push.” In order to get somewhere; to achieve something worthwhile, one often has to push. For our two sets of adventurers this summer it was literally their pedals; however, they were also pushing the boundaries of their knowledge, expanding their understanding of the world by venturing into the unexplored. They were pushing themselves.